Yolanda Kondonassis is celebrated as one of the world's premier solo harpists and is widely regarded as today's most recorded classical harpist. With "a range of colour that's breathtaking" (Gramophone), she has been hailed as "a brilliant and expressive player" (Dallas Morning News), with "a dazzling technique unfailingly governed by impeccable musical judgment" (Detroit News). She has appeared around the globe as a concerto soloist and in recital, bringing her unique brand of musicianship and warm artistry to an ever-increasing audience. Also a published author, speaker, professor of harp, and environmental activist, her many passions are woven into a vibrant and multi-faceted career. The first harpist to receive the Darius Milhaud Prize, Kondonassis is committed to the advancement of contemporary music for the instrument, with recent premieres including works by Bright Sheng, Keith Fitch, and Gary Schocker. Current projects include a Harp Concerto commission with Jennifer Higdon. With hundreds of thousands of discs and downloads sold worldwide, Kondonassis' extensive discography includes twenty titles and her 2008 release, Air (Telarc), was nominated for a Grammy Award. Her latest album, Ginastera: One Hundred, celebrates Ginastera's 2016 centennial and was released in October 2016 on Oberlin Music. Her many albums have earned universal critical praise as she continues to be a pioneering force in the harp world, striving to push the boundaries of what listeners expect of the harp. The recipient of two Solo Recitalists Grants from the National Endowment for the Arts and a 2011 recipient of the Cleveland Arts Prize, Kondonassis has been featured on CNN and PBS as well as Sirius/XM Radio's Symphony Hall, NPR's All Things Considered and Tiny Desk Concerts, St. Paul Sunday Morning, and Performance Today. In addition to her active solo, chamber music and recording schedule, Kondonassis heads the harp departments at Oberlin Conservatory of Music and The Cleveland Institute of Music, and presents masterclasses around the world. Grammy-winner Jason Vieaux, "among the elite of today's classical guitarists" (Gramophone), is the guitarist that goes beyond the classical. NPRdescribes Vieaux as, "perhaps the most precise and soulful classical guitarist of his generation." His most recent solo album, Play, won the 2015 Grammy Award for Best Classical Instrumental Solo. In June 2014, NPR named "Zapateado" from the album as one of its "50 Favorite Songs of 2014 (So Far)." Vieaux has earned a reputation for putting his expressiveness and virtuosity at the service of a remarkably wide range of music, and his schedule of performing, teaching, and recording commitments is distinguished throughout the U.S. and abroad. His solo recitals have been a feature at every major guitar series in North America and at many of the important guitar festivals in Asia, Australia, Europe, and Mexico. Recent and future highlights include returns to the Caramoor Festival, Philadelphia Chamber Music Society, and New York's 92Y, as well as his Ravinia Festival debut and performances at Argentina's Teatro Colon and Oslo, Amsterdam's Concertgebouw, and Norway's Classical Music Fest. Vieaux's appearances for Chamber Music Society of Lincoln Center, Bard Music Festival, Music@Menlo, Strings Music Festival, Grand Teton, and many others have forged his reputation as a first-rate chamber musician and programmer. He collaborates in recitals this season with Escher Quartet, acclaimed harpist Yolanda Kondonassis, and accordion/bandoneón virtuoso Julien Labro. Vieaux's passion for new music has fostered premieres of works by Avner Dorman, Dan Visconti, Vivian Fung, Keith Fitch, Kinan Abou-Afach, David Ludwig, Jerod Tate, Eric Sessler, José Luis Merlin and Gary Schocker. Jason Vieaux has performed as concerto soloist with over 100 orchestras, including Cleveland, Houston, Toronto, San Diego, Ft. Worth, Charlotte, Buffalo, Grand Rapids, Kitchener-Waterloo, Richmond, IRIS Chamber, Chamber Orchestra of Philadelphia, Chautauqua Festival, and New Hampshire Music Festival. Some of the conductors he has worked with include David Robertson, Donato Cabrera, Miguel Harth-Bedoya, Jahja Ling, Stefan Sanderling, Michael Stern, David Lockington, Steven Smith, and Edwin Outwater. During the 2016-2017 season, Jason Vieaux will make appearances with 11 symphony orchestras throughout the US and Canada, including return engagements with the Santa Fe and Edmonton Symphonies, Piazzolla's Double Concerto with Julien Labro and the Arkansas Symphony, and engagements with the symphonies of Niagra, Stockton, Illinois, and West Virginia. Vieaux will also be performing Dan Visconti's new guitar concerto, Living Language, which he premiered with California Symphony in May 2016, with the symphonies of Reading, Fort Wayne, and Richmond. Vieaux continues to bring important repertoire alive in the recording studio as well. His latest album Together, with harpist Yolanda Kondonassis, was released in January 2015. Of his Grammy-winning 2014 solo album Play, Soundboard Magazinewrites, "If you ever want to give a friend a disc that will cement his or her love for the guitar, this is a perfect candidate," whilePremier Guitar claims, "You'd be hard pressed to find versions performed with more confidence, better tone, and a more complete understanding of the material." Vieaux recently recorded Alberto Ginastera's Sonata for Guitar Op. 47 for a Ginastera Centennial album produced by Yolanda Kondonassis, which will be released in October 2016 on Oberlin Music and features additional performances by Kondonassis, violinist Gil Shaham, and pianist Orli Shaham. Vieaux's album with bandoneonist Julien Labro will also be released in October 2016 on Azica Records. Vieaux's previous eleven albums include a recording of Astor Piazzolla's music with Julien Labro and A Far Cry Chamber Orchestra; Bach: Works for Lute, Vol. 1, which hit No. 13 on Billboard's Classical Chart after its first week and received rave reviews by Gramophone, The Absolute Sound, and Soundboard; Images of Metheny, featuring music by American jazz legend Pat Metheny (who after hearing this landmark recording declared: "I am flattered to be included in Jason's musical world");andSevilla: The Music of Isaac Albeniz, which made several Top Ten lists the year of its release. Vieaux's albums and live performances are regularly heard on radio and internet around the world, and his work is the subject of feature articles in print and online around the world, including such magazines as Acoustic Guitar, MUSO, Gramophone, and on NPR's "Deceptive Cadence." Vieaux was the first classical musician to be featured on NPR's popular "Tiny Desk" series, on which he made a rare repeat performance in 2015 with Yolanda Kondonassis. Vieaux is affiliated with Philadelphia's Astral Artists. His primary teachers were Jeremy Sparks and John Holmquist. In 1992 he was awarded the prestigious GFA International Guitar Competition First Prize, the event's youngest winner ever. He is also honored with a Naumburg Foundation top prize, a Cleveland Institute of Music Alumni Achievement Award, and a Salon di Virtuosi Career Grant. In 1995, Vieaux was an Artistic Ambassador of the U.S. to Southeast Asia. Jason Vieaux is represented by Jonathan Wentworth Associates, Ltd and plays a 2013 Gernot Wagner guitar. 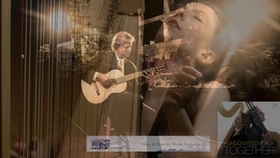 Yolanda Kondonassis, harp & Jason Vieaux, guitar come - Together on Azica Records. 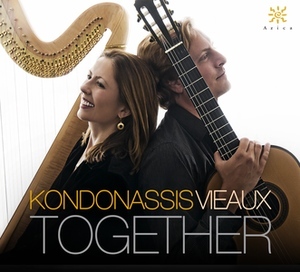 READ THE Cleveland Plain Dealer REVIEW Colleagues at the Cleveland Institute of Music, harpist Yolanda Kondonassis and guitarist Jason Vieaux also make excellent partners in the recording studio, as this new disc - Together demonstrates beyond doubt. Not only do their instruments share an ancient lineage, but their artistic personalities and technical prowess also intertwine neatly, resulting in experiences both scintillating and haunting. Their repertoire is no less exotic or compelling. World premieres of commissions from Gary Schocker and CIM's own Keith Fitch here rub shoulders elegantly with works by Pujol, Montsalvatge and Hovhaness. Surely, hopefully, these two have more exploring to do. 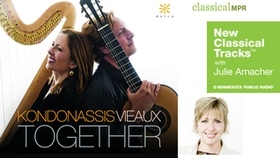 Listen to Julie Amacher's New Classical Tracks interview with harpist Yolanda Kondonassis and guitarist Jason Vieux. New Classical Tracks is a Syndicated feature airing Nationally on PRI: Classical 24 & Statewide on Minnesota Public Radio. READ THE TRANSCRIPT - "You know, what I like about this collaboration is that it did evolve naturally and slowly. I didn't feel forced or rushed. It was organic in its evolution." That's how harpist Yolanda Kondonassis talks about her new collaboration with guitarist Jason Vieux. It's a recording appropriately titled Together. "We picked our repertoire, we had some things commissioned," she says. "We did some concerts together. In this crazy world of ours, very often collaborations can feel a little bit frenetic. You come together, you rehearse quickly, it's intense, you grind things out. And this just really felt like it kind of evolved because it wanted to." "And we weren't afraid of taking our time," Jason adds. "Maybe that is because we knew we'd always be seeing each other around at the Cleveland Institute of Music. So we wanted to evolve the right way until we got a program that we were really satisfied with." As teachers at the Cleveland Institute of Music, Yolanda Kondonassis and Jason Vieux often pass one another in the hallway. It was Yolanda who finally suggested they play together sometime. The first work they performed together in recital was the Sonata for Harp and Guitar by Alan Hovhaness, subtitled "Spirit of Trees," which appears on this recording. "Hovhaness is such an interesting composer because he dabbles in the mystical and the spiritual and the Asian sonorities and at times is really quite traditional and tonal - he's sort of an original eclectic," Yolanda explains. "When you're dealing with two instruments that are a little bit less heard and seen together, I think it's nice to have a piece that's a little bit of everything, something for everyone. That was a good place for us to start." Jason agrees. "His musical perspective through that piece really suits the two instruments very well," he says. One goal of this collaboration, according to Yolanda and Jason, is to encourage the creation of more repertoire for harp and guitar. In fact, Yolanda and Jason offer two world premieres on this recording. One is by composer Gary Schocker, who's also a harpist. Schocker's suite, Hypnotised, contains a movement called "Together" which gave this album its title. "I think the title suggests two instruments that have their own solo repertoire and their own chamber music repertoire as well, but coming together for something that's a little more unusual, a little more unique," Jason says. "It's been said by quite a few folks - and I think Jason and I would agree - that it's hard to tell which instrument is playing at any given time when there's a true blend," Yolanda clarifies. "Much of what we do is a conversation, but also there's that fusion, and I think that's also suggested in the title. Is it almost a third instrument in a way, not the guitar, not the harp but … a blend of the two? That, I think, is reflected in that word 'Together,' as well." The recording opens with "Suite Mágica" by Argentine composer and guitarist Maximo Diego Pujol. Yolanda says this piece demonstrates the percussive qualities of both instruments. "I think we'd be remiss if we didn't include something with a great Latin influence, because both of our instruments are so prevalent in the Latin cultures," she says. "It's a suite of dances: The first movement is an introduction, then followed by a Valse, then a Tango, the very quintessential Argentine dance form. Then finished by a Candombe, which is very cool because we each get a bit of a drum solo at the end. We thought it was a great way to start the album and highlight that conversational fusion of sound." Composer Keith Fitch makes special sound effects a centerpiece of his world-recording piece titled "Knock on Wood." "He makes specialty sounds on the two instruments, and particularly on the harp, a real focal point on this work," Yolanda explains. "He has the harp doing glissandos of all different kinds, gushing chords, washboard, strumming, whistles, which requires you to slide your hand up the bass wires of the string, make sort of a hydroplaning sound, sort of like a whoosh. Normally we slide the finger across the string to make that beautiful traditional harp sound. This piece even uses the pedal to gliss, which quite a few composers are doing now. Keith incorporates it in a highly rhythmic way which - I won't lie - is really tough on the harp, to be in mixed meters and doing all sorts of other effects and at the same time sliding your pedals between positions. He really explores the special-effects potential on harp in this piece." Together, a new recording from Yolanda Kondassis and Jason Vieux. An organic collaboration between friends and colleagues, "I hope I'm always growing," Jason says. "You want to be growing and learning and getting better with each project and collaboration and each musical experience. And this is definitely one of those things, where you feel like, I definitely haven't done something like this before." "There's no better lifetime education than being a teacher," Yolanda adds. "On top of that, we have these cool special projects that really stretch us. I think of that Nelson Mandela quote, It always seems impossible until it is done. There are a lot of things that seem a little far-flung, maybe that's a reach. Then it gets done and you're glad you did, and now you know how to do the next one." 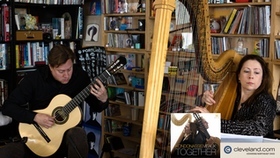 Internationally acclaimed harpist Yolanda Kondonassis and virtuoso classical guitarist Jason Vieaux joined forces earlier this year to release their first duo recording, Together, which features original works for harp and guitar including Alan Hovhaness' Spirit of Trees, Xavier Montsalvatge's Fantasia, Máximo Diego Pujol's Suite Magica, and two world premiere recordings of works commissioned by the duo: Knock on Wood (2012) by Keith Fitch and Hypnotized (2013) by Gary Schocker. The disc marks Kondonassis' 19th album in a Grammy-nominated recording career that has broken boundaries with hundreds of thousands of discs and downloads sold worldwide. It is Vieaux's 13th recording and follows his most recent album, PLAY, for which he received a 2015 Grammy nomination for "Best Classical Instrumental Solo." Kondonassis says, "A common thread in compositions written for harp and guitar is often a nod to world music cultures – Latin, Asian, Middle Eastern, and everything in between . . . the result is a sonic space unlike most chamber music territories." Vieaux adds, "Part of what we're doing is attempting to expand the repertoire for guitar and harp because we think the combination of these two instruments is beautiful." Attached is Yolanda and Jason's interview with KHFM: Albuquerque - Brent Stevens who relished the opportunity to get the duo. Stevens already knew Jason who is approachable and interesting, and Yolanda lived up to his expectations. He commented that she was "charming and loves the music... what's not to like? They sound like they have fun being together." Listen to the attached clip. 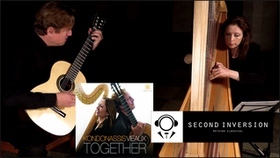 Internationally acclaimed harpist Yolanda Kondonassis and virtuoso classical guitarist Jason Vieaux joined forces to release their first duo recording, Together, which features original works for harp and guitar including Alan Hovhaness' Spirit of Trees, Xavier Montsalvatge's Fantasia, Máximo Diego Pujol's Suite Magica, and two world premiere recordings of works commissioned by the duo: Knock on Wood (2012) by Keith Fitch and Hypnotized (2013) by Gary Schocker. Together will be released on Azica Records on January 27, 2015 at all major retailers. 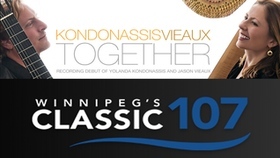 The disc marks Kondonassis' 19th album in a Grammy-nominated recording career that has broken boundaries with hundreds of thousands of discs and downloads sold worldwide. It is Vieaux's 13th recording and follows his most recent album, PLAY, for which he received a 2015 Grammy nomination for "Best Classical Instrumental Solo." 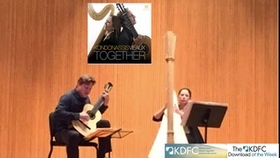 Of Together, Kondonassis says, "A common thread in compositions written for harp and guitar is often a nod to world music cultures – Latin, Asian, Middle Eastern, and everything in between . . . the result is a sonic space unlike most chamber music territories." Vieaux adds, "Part of what we're doing is attempting to expand the repertoire for guitar and harp because we think the combination of these two instruments is beautiful." WRCJ: Detroit - Chris Felcyn sat down with the duo to discuss their careers and the new disc Together. The segment will air Today, Sunday March 22 on 'The Listening Room. Listen to the attached clip. 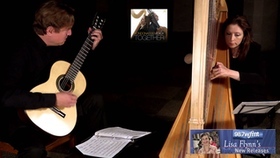 Internationally acclaimed harpist Yolanda Kondonassis and virtuoso and GMAMMY Award winning classical guitarist Jason Vieaux recently joined forces to release their first duo recording, Together, on Azica Records. 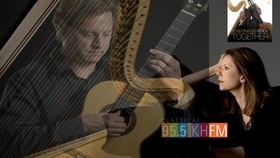 Featuring original works for harp and guitar including Alan Hovhaness' Spirit of Trees, Xavier Montsalvatge's Fantasia, Máximo Diego Pujol's Suite Magica, and two world premiere recordings of works commissioned by the duo: Knock on Wood (2012) by Keith Fitch and Hypnotized (2013) by Gary Schocker, Together was released on January 27, 2015 at all major retailers. Kondonassis says, "A common thread in compositions written for harp and guitar is often a nod to world music cultures – Latin, Asian, Middle Eastern, and everything in between . . . the result is a sonic space unlike most chamber music territories." Vieaux adds, "Part of what we're doing is attempting to expand the repertoire for guitar and harp because we think the combination of these two instruments is beautiful." Classic 107 Winnipeg - Michael Wolch sat down with the duo to discuss the album and this unique collaboration. Listen to the attached clip. Cleveland area classical guitarist Jason Vieaux won a Grammy Award last Sunday in Los Angeles in the category of Best Classical Instrumental Solo for his album, Play. He'll be John Rittmeyer's guest on the next Fretworks, for conversation about his career and some performances recorded when he was in Columbus last month. Fretworks has already featured tracks from this great CD of guitar favorites on the program in the past, but Jason will be playing a couple of them live in the studio for us. 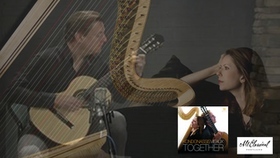 Jason has recently joined forces with Yolanda Kondonassis to release their first duo recording, Together, which features original works for harp and guitar including Alan Hovhaness' Spirit of Trees, Xavier Montsalvatge's Fantasia, Máximo Diego Pujol's Suite Magica, and two world premiere recordings of works commissioned by the duo: Knock on Wood (2012) by Keith Fitch and Hypnotized (2013) by Gary Schocker. Together will be released on Azica Records on January 27, 2015 at all major retailers. The duo will make its New York debut at the 92Y on February 28, 2015 as part of the Art of the Guitar series. 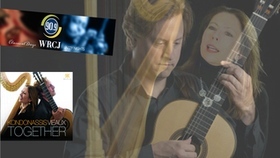 Join me for Fretworks on WOSU - Classical 101: Columbus OH this Valentines Saturday February 14 at 7 pm and the following Wednesday evening at 7 for Jason Vieaux.